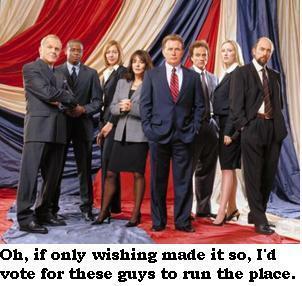 Think about it people, in the wise words of one Miss CJ Cregg, "decisions are made by those who show up. You gotta rock the vote." (okay, its possible someone else said this before her, but she's who I remember saying it). Its just that simple, if you don't vote, you can only blame yourself if something doesn't go the way you want it to in the federal, state or local government. And this being a mid-term election, most people don't think it is as important, but people it is just as, if not MORE, important to vote in this one because if you know anything about government, you know that technically the legislative branch (aka Congress) is the one with all the power. Tragically, in the past few years it has appeared that the executive branch has been the one making all the decisions, and really...its kinda true, so, fix it! Make the House and the Senate the ones with the speaking power so that in TWO years (not next year like some people coughcoughJohnGrandicoughcough think) we can fix the Presidency too.